Afghani Bolani is a traditional stuffed flatbread from Afghanistan. There are various options when it comes to the stuffing - potato, sweet, potato, spinach, pumpkin, lentils, etc. 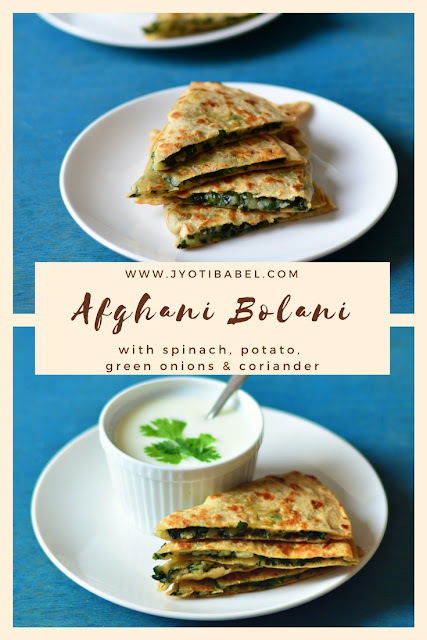 The recipe for Afghani Bolani I am sharing today comes with a stuffing of potato, spinach, green onions and coriander. While searching for an authentic Bolani recipe online, I came to know that these Bolanis can be either fried or shallow fried. Typically, it is made with maida but I have made them with whole wheat flour. In Afghani cuisine, this dish can be served warm as an appetizer, side dish or even as a main course item. It goes very well with yoghurt. This dish has a striking resemblance to our Indian Stuffed Aloo Paratha. Without with ado, let's check out how to make Afghani Bolani. 1. Using the ingredients listed for the dough, knead a smooth and soft dough using water. Cover the dough with a wet cloth and set it aside for 20 minutes while we work on the stuffing. 2. Blanch the spinach in boiling water. When it wilts, pour cold water over it. Squeeze out as much water as possible from the spinach and chop it finely. 3. In a pan heat oil, and add the minced chilli, chopped spring onions, and spinach and saute for a few minutes. Add salt and pepper and stir. Add the mashed potatoes and coriander and stir it nicely. Check seasoning and adjust if needed. Switch off the flame and let the stuffing cool down a bit before we can start making Afghani Bolani. 4. Take the dough and divide it into 6-8 equal dough balls. Take one and let the rest sit covered under a wet cloth. 5. Using some dry flour, roll the dough ball into a 8" circle. On half of the circle spread the filling and cover the filling with the other half of the circle. Pinch the edges of the semi circle. 6. meanwhile, also keep a griddle pan heated and apply some oil over it. Place the stuffed semi circle on the pan and cook it till brown spots appear on one side. Apply some oil on the other side and flip it. Cook the other side till brown spots appear there as well. 7. When both sides are cooked well, take it off the pan. Repeat the same with all the dough balls till all the stuffing is used. 8. Slice them into 2-3 halves and serve. These Aghani Bolani taste good when served warm with a bowl of yoghurt. You can also serve it with raita and green chutney for an Indian twist. This stuffed flatbread from Afghanistan is my entry for BM#86 Day #2 under the theme - 'Stuffed Flatbreads from Different Countries.' My BM #86 Day #1 post was a stuffed flatbread from India - Puran Poli. The pictures have come out so well Jyothi, this bolani is one of my favorites!..lovely pick for the theme. 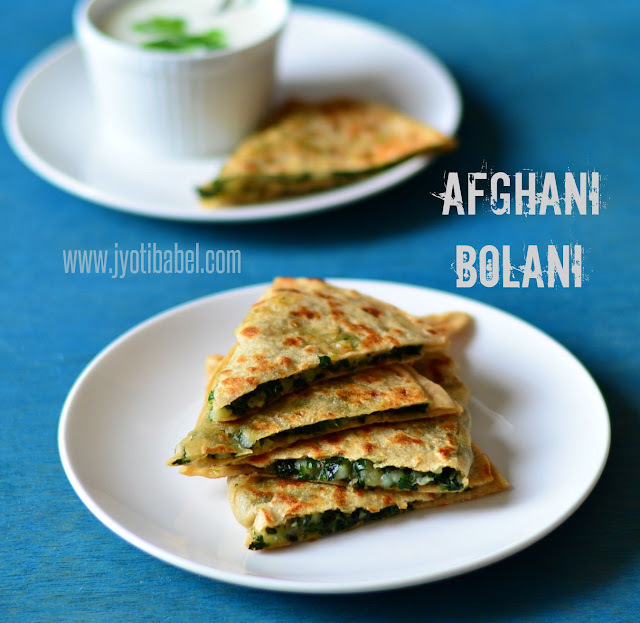 Afghani bolani is in my to do list and your post is making me literally drool enough to try. Love the filling. Beautiful pictures and inviting platter too. Looks like Afghani bolani is the star flatbread of this theme, and simply love that stuffing. You nailed them prefectly. Afgani bolnai looks very inviting, looking at those cut triangles it is very difficlut to control. I am loving these, kind of stuffted flatbreads in different names. 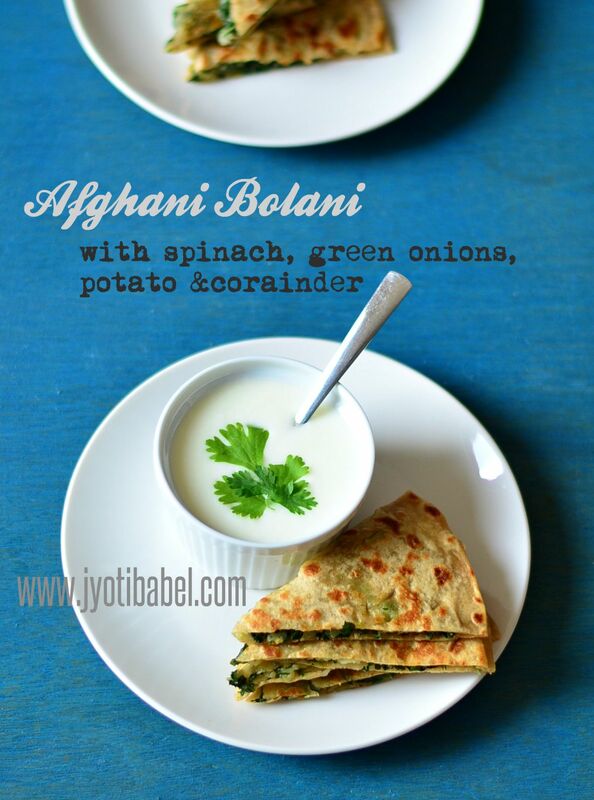 I love these Afghani aloo paratha :-) Adding spinach and spring onions made these extra special and extra healthy.